I am indepted to Bob Herrendeen for this excellent presentation. A common problem found in R390’s is non tunable or non functional BFO adjustment. This problem was apparent on the unit I have just begun to restore. (S/N 61). The variable oscillator is controlled by a variable inductance housed in sealed can located in the IF module. 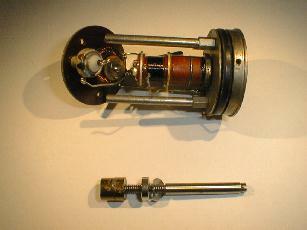 It is connected to the front panel through a clamped shaft and later a bellows link to the sealed module. To center the BFO frequency to the 455 IF frequency, one must rotate the external shaft until it is zero beat, and then set the knob to center. If there is no end stop on the shaft, or one continues to rotate the shaft beyond the end point pressure washer, then the threaded shaft attempts to pull out of the core, crushing the core against the bottom of the internal shaft bushing. I also noticed that the threads are backwards from standard rotation, which can be confusing if you think you are actually screwing the core into the coil. After opening the unit, it becomes obvious what the problem is when the core pieces fall out of the coil! At first, I thought that it would be impossible to find a replacement. I later was able to purchase one from Fair Radio, but had already decided to attempt to repair the core since the core section that does most of the tuning was still intact. The section that was broken was the 30% that held the threaded shaft in place. It is possible to fit the core back together and with compression, align the segmented boundaries. Having done this, I decided to assemble the four broken sections of the core into a half section, using a 3-minute epoxy designed to bond metallics. (Hardman Adhesive 04001). This was done on top of a flat surface of silicone rubber since the epoxy excess would not stick to the surface and I could get good surface flatness on the top of the core. Great care must be taken not to get excess epoxy onto the area to be bonded to the remaining half because when cured, this will interfere with the alignment of the mating surfaces. Excess epoxy on the outside can be scrapped off with a razor blade and polished with emery cloth. The short 3 minute cure time was chosen so the I could easily hold the pieces in compression. The final step was to epoxy the two halves, taking care not to get excess epoxy in the center where the shaft must seat. All this work must be done with the aid of some magnification. can be seen from the picture, the threaded shaft must be inserted into the base of the coil prior to assembly onto the core. In addition, the flex washer and support plate must also be inserted prior to the core attachment. Prior to the final assembly the coil form was thoroughly cleaned and the threaded shaft was lubricated after being inserted so as to avoid contamination of the end to be epoxied into the core. In addition, since threaded shaft appeared to be cast onto the core, I thought it was important to orient the end of the shaft onto the core exactly as it was molded. This maintains good concentricity as the core moves up and down inside the coil form. Therefore, I marked the external shaft with a piece of masking tape that aligned with a mark on the core, before sliding the core down onto the shaft inside the coil. One only gets one shot at this, since the repaired core was to be epoxied onto the end of the shaft while inside the coil. By mating the core center with the correct orientation of the threaded shaft, it was somewhat self-aligning. (I tried all this without epoxy first.). After assembly and cure, I measured the resonant frequency of the new coil assembly. The repaired assembly resonance ranged from 443.274 to 462.130 kHz, while the replacement assembly measured 449.522-480.925 kHz. I believe that the difference is partly due to the fact that the repaired core sits slightly higher on the threaded shaft and therefore extends deeper into the coil at one extreme, and not as far out at the other extreme. I also noted that the replacement coil was a model 70J1, while the repaired coil was a model 70J3. 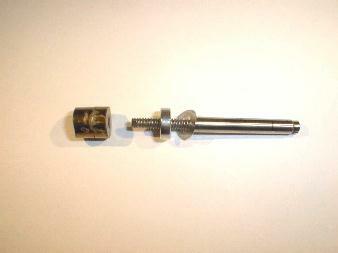 The 70J1 had a longer shaft and somewhat different internal component placement. The circuit was the same, but had a different parallel capacitor value than the 70J3 and the schematic.